Lynmar Estate, located minutes west of Santa Rosa in Sonoma County, is on many lists of the most beautiful wine destinations in Northern California Wine Country. The reasons are obvious as you follow tree-lined Frei Road northeast from Sebastopol to Lynmar Estate’s unpretentious entrance. Some wine tasting spots feature five mile views of valleys and vineyards – Lynmar draws visitors into a sanctuary of colors and textures that reflect the subtle beauty of the Russian River Valley. Except for a panoramic view east into the Laguna de Santa Rosa wetlands, the primary visual focus at Lynmar is on what lies close – vineyards, gardens and a modern tasting facility that blends in nicely with the landscape. Lynmar Estate is located within the Russian River Valley AVA (American Viticultural Area), an appellation originally established in 1983 and expanded several times, most recently in 2005. 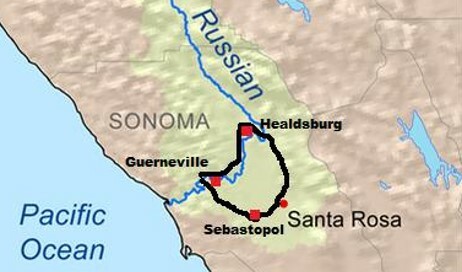 Chardonnay is the most widely-grown wine grape in the AVA, accounting for 42% of annual harvests, followed by Pinot Noir at 29% (per Russian River Valley Winegrowers). Other varietals that have found success there include Syrah and Zinfandel, with plantings of Sauvignon Blanc, Gewürztraminer, Petite Sirah, Cabernet Franc and Merlot in a few small locations. My recent Lynmar Estate tasting adventure kicked off celebration of a friend’s birthday, for which I booked the Lynmar Experience (also know as the Lynmar Lunch). As the food component of wine and food pairings offered by many popular wine destinations appears to be shrinking, the Lynmar Experience goes large. Guests are greeted with a glass of cool Rosé to sip while acclimating to the grounds. When called to table, the lunch presented is indeed a full multi-course meal (see photos below). Local ingredients from Lynmar’s gardens and local suppliers are an excellent match for a line-up of premium Russian River wines. Our wine host poured a few wines not listed on the menu, providing opportunity to compare several Chardonnay and Pinot Noir of different styles and grape sources side-by-side. An overall fun time with great food, outstanding wine and friendly people. I highly recommend the Lynmar Experience for a fun tasting and pairing adventure. The Experience is available seasonally, April through November. A Pinot & Pizza pairing is also offered, check Lynmar’s web site for specific availability. Lynmar Estate wine tastings and food/wine experiences are by appointment only, phone (707) 829-3374 for reservations. Lynmar Estate, located minutes west of Santa Rosa in Sonoma County, is on many lists of the most beautiful wine spots in Northern California Wine Country.